В отличие от фаерволов, блокирующих порты, WWDC их закрывает, отключая службы, открывающие их. Нужно устранять источник проблемы, а не симптомы. При использовании фаервола (производители антивирусов так и норовят впарить фаервол в комплекте с антивирусом) неискушённый пользователь рано или поздно может отключить его — потому что Интернет тормозит или потому что p2p не работает. Тут–то и откроются порты обратно. С другой стороны, всё те же фаерволы мешают нормальной работе p2p. Раньше просто было — поставил и запустил, один раз на Разблокировать щёлкнул, и всё. А сейчас вместе с антивирусом каждому впарили фаервол, и этот фаервол ещё же настроить надо. Чем больше хостов с закрытыми портами — тем хуже для сети. По всем этим причинам неискушённым пользователям рекомендуется вместо фаервола использовать эту небольшую программу. 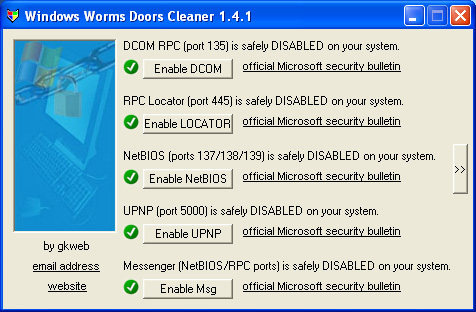 Windows Worms Doors Cleaner detects the enabled services by checking registry entries, the local open ports, and the running services. To disable something, it only modifies existing registry entries, it doesn't install anything nor modify any files. The command line parameters allow administrators to use Windows Worms Doors Cleaner from batch scripts or from other programs they develop. Thus they can automatically, by running a scheduled task for instance, disable all the services they want on a whole network without having to go on each computer manually. A home user can use the command line parameters too to check at every windows startup that the services he wants to check are still disabled, because these ones can be enabled again by installing a software or by using windows update. With them you can too control the behaviour of Windows Worms Doors Cleaner and to disable for instance the worms checking when launching the program. If you start from scratch, by formating and doing a fresh install, it is strongly adviced to use Windows Worms Doors Cleaner before to connect to the Internet, and before installing any firewall. Then, after a reboot, you can either first install your firewall or connect directly to the Internet to update your OS via Windows update. While doing updates, any program you install or above all any windows update can enable these critical services again, so be carefull to not connect to the Internet which such services enabled, it would be frustrating to do all again from scratch. WWDC — Windows Worms Doors Cleaner [Электронный ресурс] // Wwdc Тум Су. — Режим доступа: http://wwdc.toom.su/ (дата обращения: 20.04.2019).